One of the goals I had from my 101 in 1001 was to set up an Etsy account and actually sell something. Today, that happened. I set the account up months ago, but never listed anything. 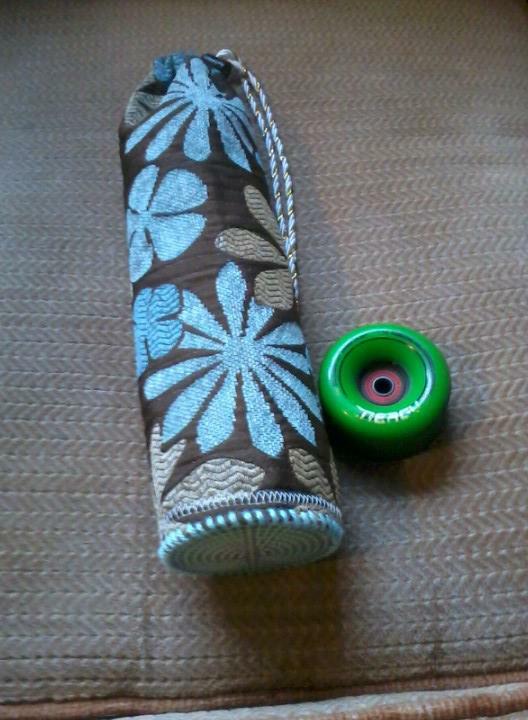 Today I added a banner and listed my first three items: cute little bags for storing your skate wheels. They’re designed primarily for derby girls, but anyone that skates on quad skates could use them, or skateboarders could use them to store two sets of wheels. To my surprise, I sold a bag today! I was so excited that I had to run right out and ship it. My friend, Rochelle ordered it. While you’re on Etsy checking out my shop, not just Derby Bella, you should go see hers too: Sink or Swim Treasures. Hopefully the shop will help me reach my Spending Diet goals but right now I am at the break-even point. For now I am happy just to have crossed another thing off the list. The camera weighs .2 lbs. but this is where I'm starting. I’m sure a points system or something similar would work just as well but I really think Jorge’s plan makes me eat better. The hardest part of being on a diet is not gorging myself on things like homemade pasta or the baked good of the week. 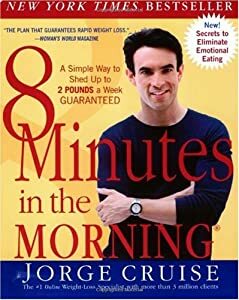 Jorge’s eating plan helps me remember that moderation is the key to weight loss. He allocates space for a treat every day and even though pasta isn’t on the “preferred” grains box, I can make it fit into my box system. Even if I eat sugar cookies for breakfast (and I did, more than once), I still have to eat six servings of vegetables. Aside from changing my atrocious eating habits, I started exercising consistently. I ran or skated at least three times a week every week. I also started doing push-ups and sit-ups regularly. Drinking lots of water helps too, but I’ve never been a big water drinker. In the summer, I drink lots but now, when it is cold out I really don’t like drinking it so I drank a lot of coffee (with milk, which I count) or unsweetened hot tea. If I drink them with my food I feel full longer and sipping hot beverages all day gives me something to do besides eat. I know caffeinated beverages are usually frowned upon for dieters, but it works for me. Now that I have reached my more-or-less goal weight and am skating “competetively”, I have modified my boxes but I sttill use them most of the time. After a lot of online research I discovered that even though protein is necessary for muscle growth, Jorge’s plan includes more than I need even though I am very active so I include more fruit than Jorge does, less protein, and more fat. I do. Just over a year ago, I started my progress on these goals. I haven’t done the greatest job of #9: Digitally document 101 in 1001 on a regular basis. While I have been working on some of the goals, I haven’t been “digitally documenting” anything. So, to start off the year, here is a blanket post updating my progress, or lack of it on the 101. 4. Re-read the Harry Potter series. Again. I have read some of these in the past year, but I can’t remember which. Or when. So, I’m not going to count my progress. I guess I’ll have to start over. 5. Read a book per month. I’ve read at least a book per month, but as with the Harry Potter series, details are sketchy so no real update here. 7. Write another article and have it published in a magazine. (2/4/11) (5/5/11) I actually have proof of when and where I did this! The folks at edible Grande Traverse have been so great to me. I really love their magazine (and them). Here is my latest article. 12. Write to my grandmothers every month. I have actually done a pretty good job of this. I sent cards, letters, and even magazines. 15. Sew a set of snack bags similar to these my friend, Lindsey made. Does one count as a set?? 18. Sew the apron that I bought fabric for in August. Yay! I did this! And, I have pictures to prove it. Will post soon. 21. Make a HufflePuff themed something for Dylan. Wow! I did this too. 22. Finish the scarf I started for Gwen on the Nifty-Knitter years ago. Define “finish”. It is as done as it can be. Somehow I have knitted it so that one color of yarn got used up faster than the other and the last row is a few inches short. I’m torn. Bind it off or frog it? 23. Learn how to turn heels and make a pair of socks. This may never happen. I’ve learned that I can barely cast-on to needles this small let alone actually knit on them. I’ve torn out the same two rows of a sock at least five times now. 24. Make baby hats for my pregnant friends. Yes! Yes, I have done most of the cooking tasks. No, I don’t have proof. 48. Sift the compost bin. Yes! I think I even have pictures. Canned lots, just not enough of the specific things needed to check off any of the things on the list. 61.Lose 25 pounds by day 101. 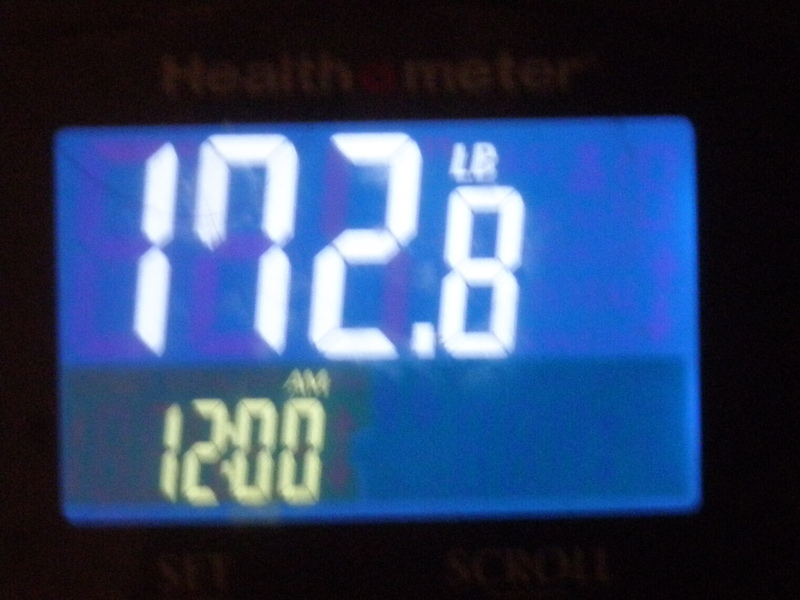 I never did get back down to the 147.8 that would have counted as completing this, but when I visited my Dr. in November (2011), I weighed in at 152 with a 22% body fat. Although I don’t completely agree with her, she told me I was at my ideal weight. According to this site, she’s correct. So, I’m counting this as finished. 62. Keep off the 25 lost pounds for the remaining 900 days. Does Christmas count? Aside from the holiday few that I put on and lost, so far so good. 63. Run seven or more 5k races. Ran the Leapin’ Leprechaun 27:17.09 Even though I haven’t really been running regularly, I did manage to complete three more races since I fell off the face of the blogosphere: Cherry Festival 5k (7/11); Zombie Run 5k (10/11); Turkey Trot (11/11). 68. Be able to complete 25 consecutive push-ups. Started this plan Yes! I can actually do 30 consecutively. I’m now working on getting up to 50. Today is push up day, so I better get on it. 70. Do yoga at least once a month. Attended class at Yoga for Health in January; practiced at Yen Yoga in February and March and joined Bikram when I joined the Roller Derby in April. Yes, I have done yoga at least once a month. 71. Fit into my skinny jeans. Yes, and Gwen’s skinny jeans, too! 76. Visit my parents at least twice a year. Yup. Went in November, and then back again for Christmas. Even saw Gramma and Grampa while we were there. 77. Take 5 camping trips. One. Went to Dunegrass Music Festival in August and camped for the weekend. 85. Pay off Bank of America Cards 86. Pay off Capital One Cards 87. Pay off Discover Card So, no real progress here, but Hubby and I have gone on a spending diet; more on that later. 90. Take my kids to the beach at least once a week all summer on each summer vacation. Yes. Some weeks we went nearly every day. 92. Try five new restaurants. So far, two. A mexican place in Detroit while we were at the Mitten Kitten Mash-Up roller derby tournament, and Harrington’s where we had “Christmas” dinner with dh’s friends. 94. Have a date night with my hubby every month. Define “date”. We have been trying really hard to spend quality time together. There were a few “real” dates that I’ll tell you about (or I won’t if I decide not to), but sometimes, around here going to Sam’s Club on sample day without any kids counts as a date. 97. Take the rest of the “extra” books to Goodwill/Women’s Resource. Done. 99. Clean out my closet every six months and donate my old clothing to Goodwill or Women’s Resource. So far, so good. So, even though I haven’t done a great job of documenting things, I have been working on my 101. As I mentioned yesterday, I hope to do a better job of posting this year. I have a post or two that I started and never finished that I should wrap up, and I have some 101 updates to work on, so hopefully you’ll be hearing from me soon! This goal may not seem like a big deal. I read lots of blogs, and I comment pretty regularly on many of them. I didn’t think about this one too much when I wrote it, but the criteria for 101 in 1001 specify that the tasks must be specific. This task was to comment on a different blog every day for a month. So, I started with old favorites and then branched out. I found some pretty great blogs along the way. ~ http://laurasrecipecollection.com/ I met Laura at a Michigan Lady Food Bloggers get-together hosted by Maggie of Dog Hill Kitchen. She has lots of great recipes on her site. Check out some of her ice cream recipes!! ~http://tcbokbok.blogspot.com/ Tony found me through my blog. We worked together with some other local chicken lovers to organize the first annual Traverse City Coop Loop last June. Our chicks are “sisters”; they all came from the same order in the same little cardboard box. ~http://motherskitchen.blogspot.com/ Mom is the hostess of the 2011 Spice Rack Challenge. I’m excited to be playing along this year. ~http://www.sustainableeats.com/ I don’t think I’ll ever reach the level of sustainability that Annette has achieved, but I look to her often for inspiration. ~http://whoneedsgauge.com/ Stephanie at Who Needs Gauge was my inspiration for starting this 101 in 1001 list. She’s starting a new list of her own if you need more inspiration for a list of your own. ~http://urbanhennery.com/ Laura at the (not so) Urban Hennery is the hostess of the Dark Days challenge. She keeps many types of animals and shares her cooking adventures but had some household excitement to finish out last year. ~http://mywheelsareturning.com/ Gary Howe. Blogger, journalist, complete streets proponent, photographer, educator, chicken-enthusiast, friend. Gary does good work over at MyWhAT. ~http://fruitcakeornuts.blogspot.com/ Shayne from Fruitcake or Nuts was also at the Michigan Lady Food Bloggers get-together hosted by Maggie of Dog Hill Kitchen. Shayne blogs mostly about food but you’ll find crafts and whatever else strikes her fancy there too. ~http://paysumattn2.wordpress.com/ This is a brand new blog! Stephanie and I have been friends for years. She used to watch Bubba for me after school when he was in kindergarten. Her kids are about the same age as mine and she is expanding her family by adopting foster children. She’s very energetic and creative, and I can’t wait to see what great things she has to share with the world. ~http://lifefullofwhimsy.wordpress.com/ My friend Lindsey was inspired to create her own 101 in 1001 after she read mine. Now that hers is up I’ve thought of new things to add to my own. Next time. She does lots of cool crafty things and outdoor activities with her kids. Plus she makes these sandwich bags that I love! ~http://fastgrowtheweeds.com/ El at fast grow the weeds keeps bunnies, chickens and goats. She plans to get some sheep this year and runs a winter CSA from her hoophouse. She’s also planning on starting with bees this year; I can’t wait to follow her journey into beekeeping. ~http://alexandernieto.blogspot.com/ Wow. I didn’t realize I had so many blogger friends. Maybe we need a get together this summer! Krista and I met working on the Family Wisdom Conference last year. Her blog is mostly family photos, but she has some interesting knitting/crafty posts too. ~http://doghillkitchen.blogspot.com/ Finally got to Maggie at Dog Hill Kitchen. Right now she’s got some beautiful winter photos but shares amazing recipes. She cooks around all sorts of food sensitivities but the food is so good you’d never guess it was anything-“free”. ~http://putyourshovel.blogspot.com/ I don’t remember what I commented on! I was so sick this day that I could hardly remember to get up and comment so that I wouldn’t ruin my streak. However, this is a great site and I check it regularly; so should you. ~http://homesteadrevival.blogspot.com/ I found this blog through a Simple Lives Thursday link up and have been back many times. Every time I visit I find something useful like the seed starting chart I commented on today. ~ http://katehofmann.blogspot.com/ Kate is my neighbor and the hostess of many fabulous Stone Soup and other social gatherings. She has a cute dog, an amazing garden and takes beautiful photographs. ~http://mrsstrickersclass.wordpress.com/ Last year I started a blog for my class at school. We haven’t been posting much this year but the kids have recently discovered the joy of blogging so I stopped by and commented on a short piece one of my younger students wrote. ~http://besquirrely.com/ Ashlea lives in my neighborhood. Her site is beautiful and she blogs about all sorts of things including her garden, being greener, and her daughter, Wren. ~ http://threeandathirdhomestead.blogspot.com/ Have a blog? Ever check the stats? Sometimes you get traffic from a site you don’t recognize. That’s how I found Three and a Third Homestead. They’re trying to get chickens in their town but have been unsuccessful so far. ~ http://put-a-lid-on-it.blogspot.com/ Elle at Put a Lid On It shares lots of canning recipes but has committed to the Spice Rack Challenge and wants to bake bread every month. Her focaccia looks delicious! ~ http://the-wynk.net/ Wynk at My Own Little Dust Pile knits and cooks and gardens; all things I love. Check out her beautiful cinnamon rolls. Or her perfectly turned socks. 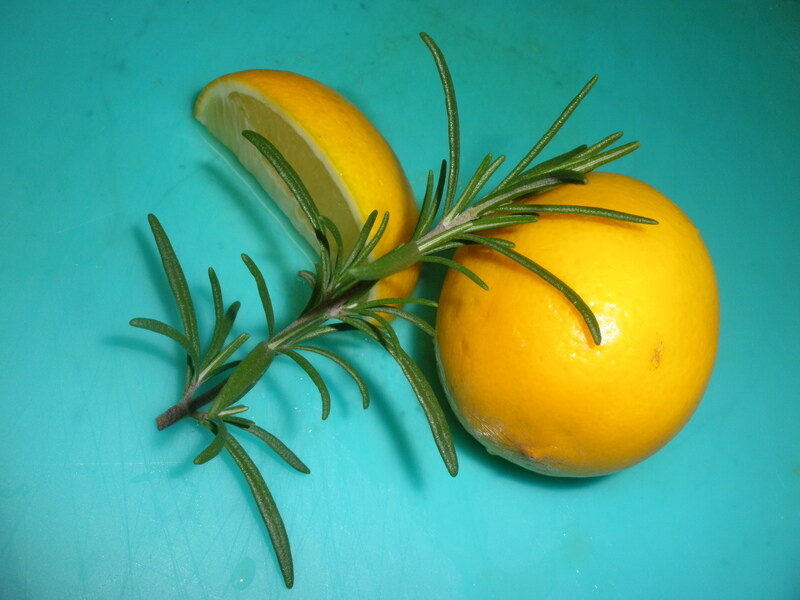 ~ http://bonzaiaphrodite.com/ Green cleaning recipes, vegan cooking, chickens, general craziness. Bonzai Aphrodite has a beautiful site. ~ http://www.mrswheelbarrow.com/ Guess what? I signed up for another blog challenge! This one is going to rock. Charcutepalooza is all about the preserving of meats. Check back on the 15th of every month for a post. ~http://growandresist.com/ LOVE this blog. Always. Great posts about food, gardening, chickens, life. Go now. ~ http://arcticgardenstudio.blogspot.com/ Nicole from Arctic Garden Studio lives in Alaska and blogs mostly about food; check out her exhaustive collection of delicious-sounding recipes. I plan on trying many of them out this year. ~ http://blue-dirt.blogspot.com/ Anna at Blue Dirt blogs about food, farming, crafts and more. She made an adorable backpack for her son. Since I’m working on two at the moment, it was nice to see somebody else’s success! ~ http://sauvageblue.blogspot.com/ Cindy at Sauvage Blue writes about food and knitting. She also has some completely random posts about dogs, or photos or her day. Fun place to visit. ~ http://tigressinapickle.blogspot.com/ Homemade mustard?!? I must try this! Tigress was the gracious host of last year’s Can Jam Challenge. 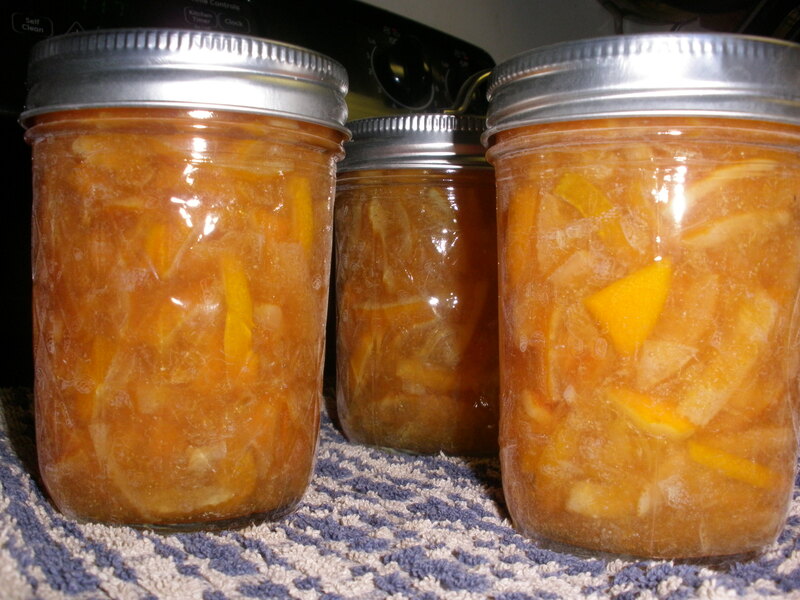 Check out her site for lots of excellent canning recipes. ~http://rawkinraw.wordpress.com/ Celeste @ RAWkin RAW Vegan made an impressive purple kraut but blogs about raw food and improving your overall health. ~ http://hauteapplepie.com/ How can you not love a blog with pie in its name?? Anne, Katie and Stef share recipes, party ideas and much more. Plus, they look good in aprons! ~ http://grownaway.blogspot.com/ Fred at Grown Away is participating in the Dark Days Challenge and gardens. He had ripe tomatoes last July?!? Wish I did! ~http://www.bloombakecreate.com/ Lynda at Bloom, Bake Create crafts, cooks and gardens. I look to her for soap inspiration and all kinds of recipes. She’s also a very supportive “blog friend”. She comments regularly on my posts which has lifted my spirits more than once. ~http://littlehouseinthesuburbs.com/ Ivory Soap and Tomato Lady have lots of great gardening, cooking and crafting ideas. Where do you think I learned to make soap out of bacon fat?? They also have lots of cool garden planning tools and printables. ~ http://anaustinhomestead.blogspot.com Miranda blogs about, “One woman’s sustainable, yummy, and experimental adventures. . . in suburban Texas, including urban chickens, vegetable gardens, canning, cheesemaking, cold process soap, handmade clothes, crafts and recipes.” Hmm. I wonder why I like this blog? she had added to her page. It intrigued me, so I clicked it as I am oft prone to do. It took me to Mrs. Wheelbarrow’s Kitchen where I learned more about Charcutepalooza and The Year of Meat. I was deeply saddened to learn that I was too late to jump on the Meat Bandwagon. Or was I? Much to my delight the challenge had been extended. And, there are prizes. Glamorous, wonderful prizes. Okay, I won’t be winning this one. It isn’t random. The competition is fierce. I am relatively new to the art of charcuterie and I take horrible pictures. However, I enjoy trying new things. I like eating local food and prefer sustainably raised meats. Homemade andouille sausage is amazing. My husband eats more bacon than I thought was humanly possible. Making my own sausage and bacon seems like a perfectly logical thing for me to do. I missed the deadline for the first post, Duck Prosciutto, but since I signed up late I can catch up later by making duck prosciutto before the end of the year as long as I complete the rest of the posts on time. February’s challenge is bacon. Hubby is happy, I’m happy, everyone wins. The recipes for the challenge come from Charcuterie: The Craft of Salting, Smoking, and Curing. The challenge isn’t just to write recipe posts about how we make the meats, but to write posts about how the finished meats are used. Watch for those posts on the 15th of each month from now until December. Bacon is an excellent meat to start with; it couldn’t be easier. Look at the marbling on that pork belly! So, I ordered a 2 lb. pork belly from Oleson’s Market and got to work. Mixed up and ready to coat the meat. First, get out the scale and measure 8 oz. 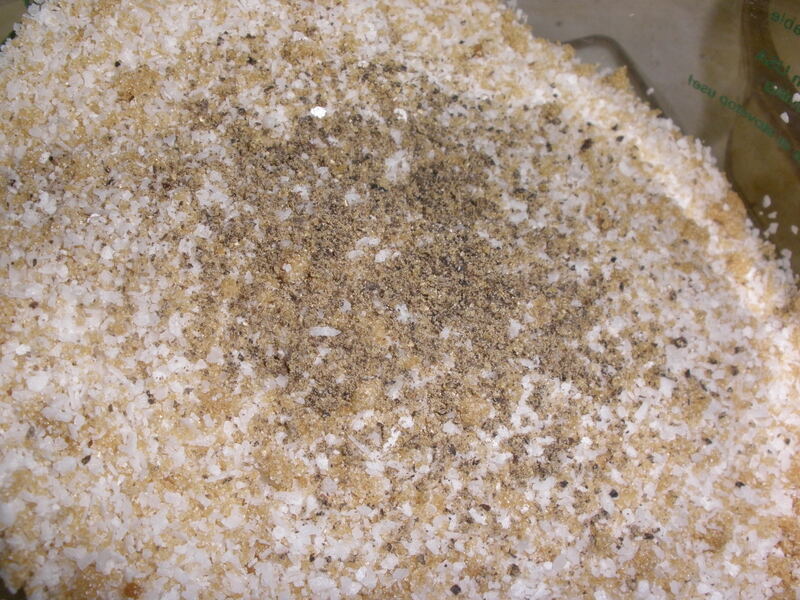 of Kosher salt into a dish. Add 4 oz. of brown sugar and a few turns of cracked pepper. Mix it all together with a fork. 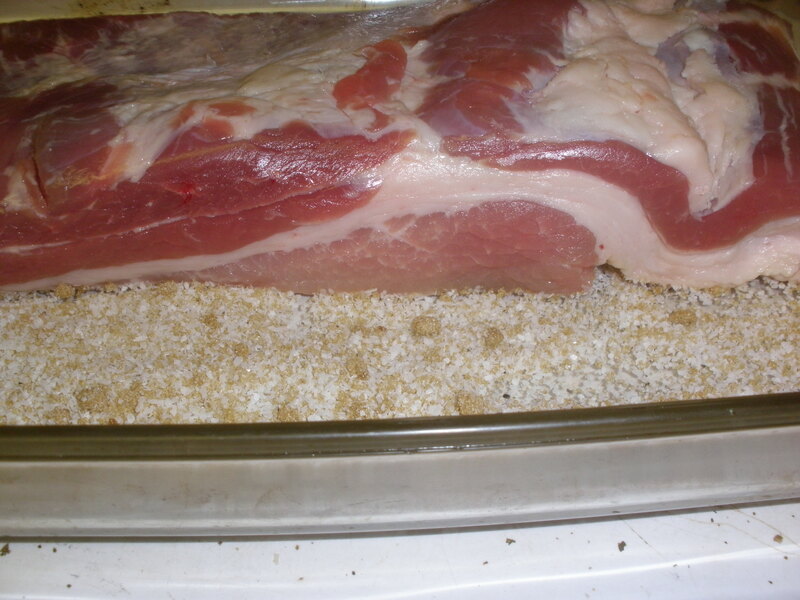 Dump the mixture into a baking dish and dredge the pork belly in it. Pork dredged in seasonings and ready for the fridge. Cover the pork belly and refrigerate for a week, flipping daily. Are you excited yet? Check back next week for the conclusion of this thrilling tale. So, I figured I have a half an hour to kill while the cake bakes. I could go read Harry Potter, or I could try to get caught up on some of my posts. I have goals after all. Hubby has been laid off since Christmas. While he’s been looking for jobs and applying for jobs, he’s probably going to be unemployed for a while. Although the drop in income is going to be a struggle, it has been really wonderful having him home. He’s been cooking and cleaning and doing laundry. Ok, he always did the laundry, but sweeping the kitchen floor?? Bring water to a boil in a 2 quart saucepan. Mince the herbs and crush the garlic and spices with a rolling-pin or a mortar and pestle. Add all ingredients into the boiling water, stirring the honey until dissolved. Bring the entire mixture to a boil and then let cool to at least room temperature before proceeding. 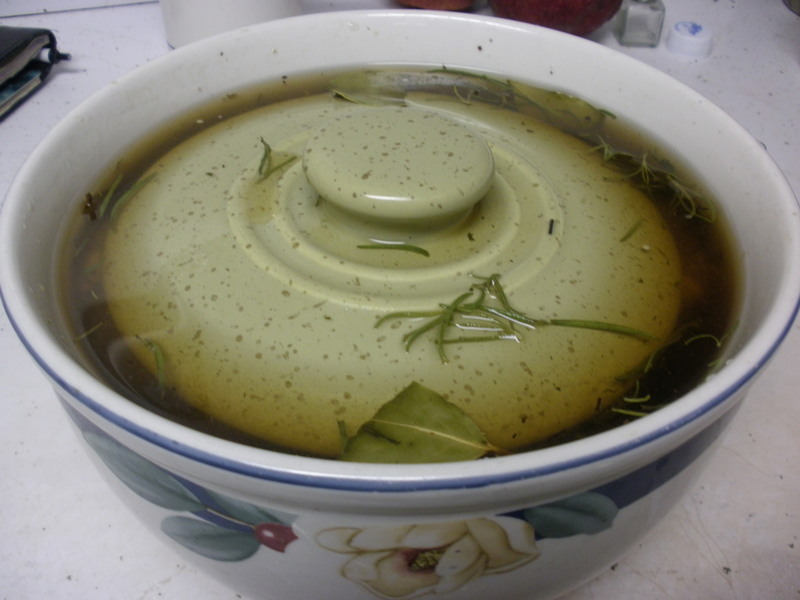 Once the brine has cooled, transfer brine to a large, non-reactive bowl and add a 2-ish pound pork roast. Ours was from the half hog we got from Olds Farm late last summer. Cover with a plate or other weight to keep the pork submerged. 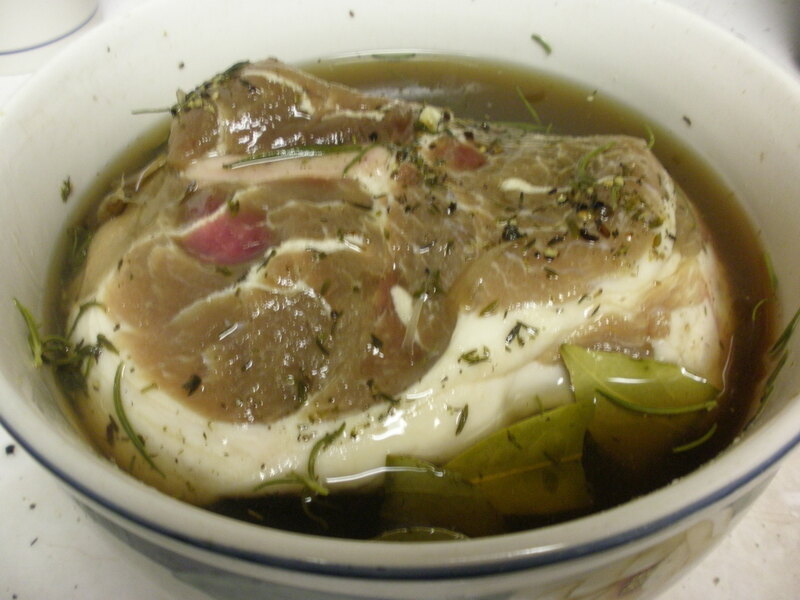 Allow the meat to soak in the brine overnight. 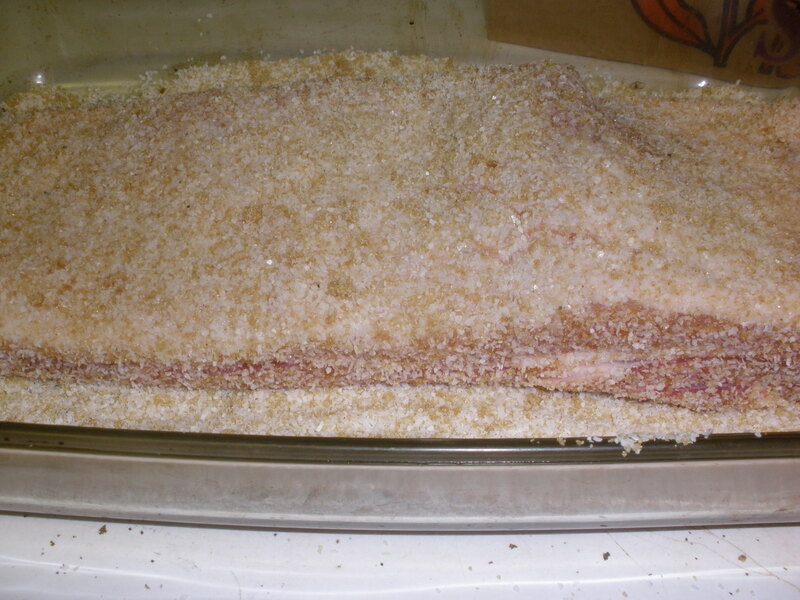 After the pork has soaked overnight, remove the meat from its brine and blot it dry. Let the pork rest for thirty minute before cooking. 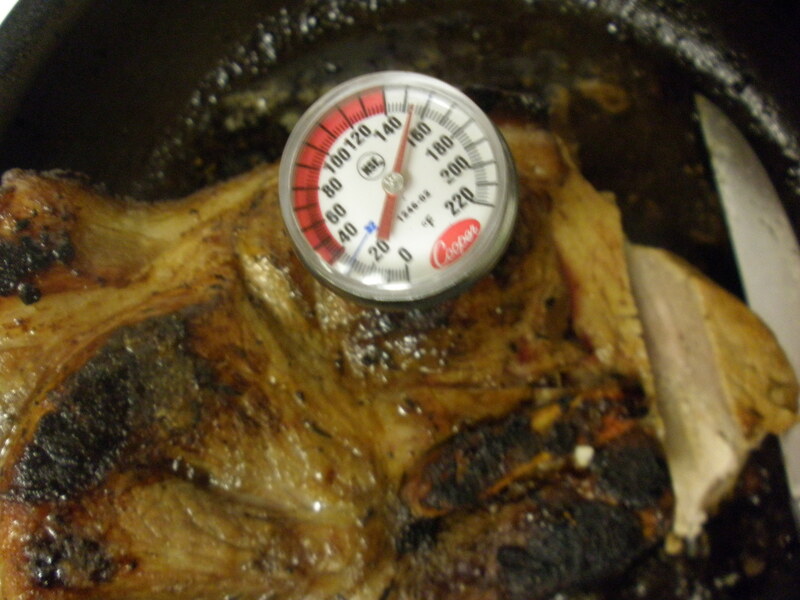 Cook at 350 degrees until the meat reaches an internal temperature of 150 degrees. (This took almost an hour, but I started checking every ten minutes after the first thirty. Let the roast rest for ten minute before serving. Fully cooked and ready to serve. This brined pork was delicious! 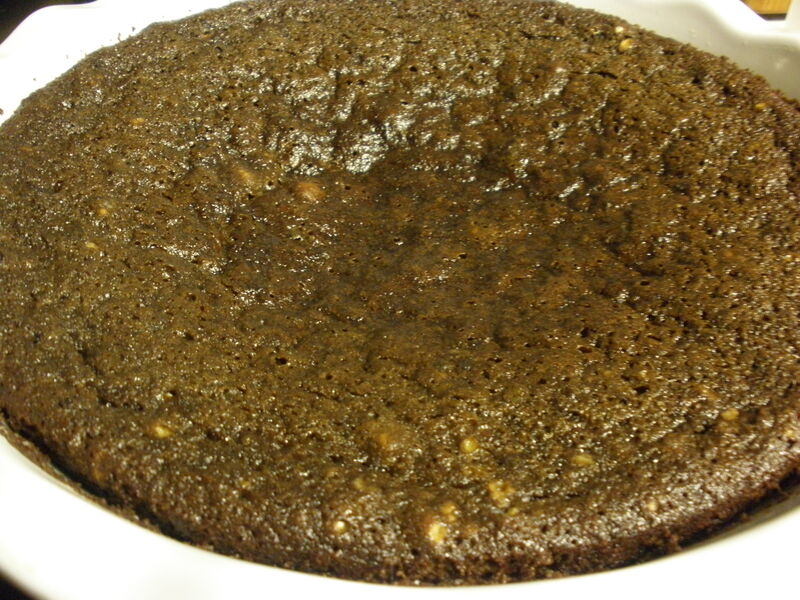 It stayed very moist and the flavor was incredible. We’ve already discussed trying other herb and spice combinations but have decided that if we try this particular recipe again we will cut the salt by about half. Wash about 2 lbs. of redskin potatoes (Westmaas Farms), stab each with a fork a few times and bake until fully cooked. Scoop the insides from the potato skins and deposit them into a bowl. Run the potatoes through a ricer or food mill. Mix the potatoes with 2 beaten egg yolks, 1 1/2 cups flour (spelt; Organic Bean and Grain) and a pinch of salt. Stir until pliable and roll into 3/4″ tubes. Cut the tubes into 1″ pieces. Pinch each piece to create dimples and drop onto a plate. Freeze the gnocchi until firm. 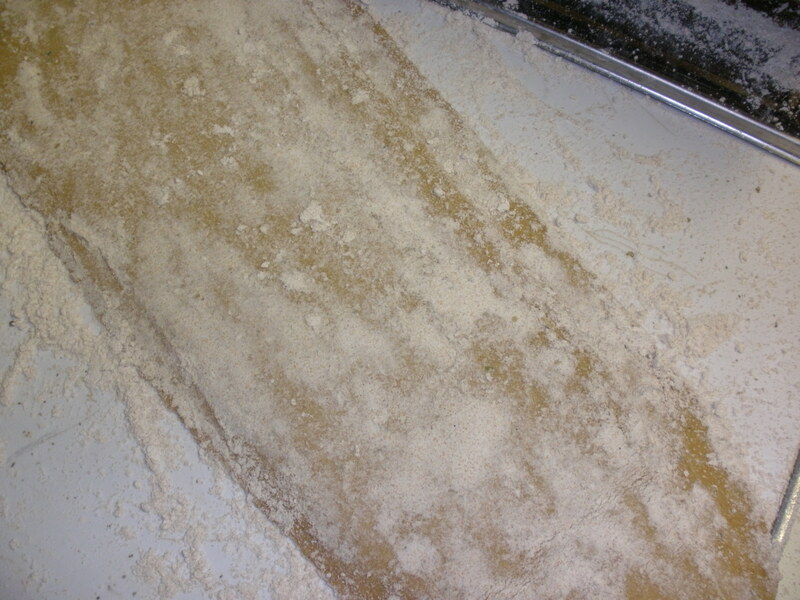 Cook by dropping into salted, boiling water until the dumplings float or store individually frozen gnocchi in an air-tight container for several months. 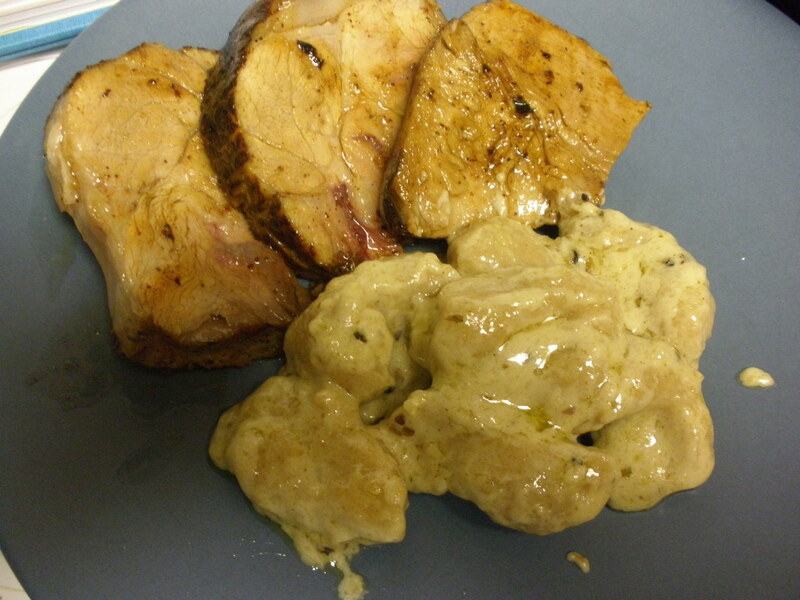 Roasted brined pork with homemade gnocchis in garlic cream sauce. After the gnocchis were boiled I dropped them into a hot skillet with a Tablespoon of butter, sprinkled them with a Tablespoon of flour and slowly stirred in Shetler’s heavy cream until a thick “Alfredo” sauce was formed. You could add whatever herbs and spices you like to the sauce but I just added salt, pepper and a little minced garlic. Have you ever been stuck in a rut? I have. That’s where I seem to be now. I started the year out blogging like crazy and fired up on my 101 in 1001 challenge. I’m still fired up about the challenge, but that’s kind of where the rut started. I have posts started that will document things after they are finished, but they are in progress. I’ve also taken pictures of lots of things. Food mostly. I’ve also been running three days a week (#60) and commenting daily on other blogs (#8) despite being sick on and off for most of this month. I wrote another magazine article which should go to print soon (#7) and I’ve written to my grandmothers twice (12). I started a backpack for Gwen (#29) and bought the fabric for the laptop case (#27). I registered for a 10k (#65; the Bayshore, May 2011) and attended yoga (#70). So, I’m here. And I’m busy. And I have lots of posts up my sleeve. I’m hoping to get 30 posts done in 30 days, but that would mean a crazy day filled with posts in the next day or two and I’m not sure I’m up to it. Any advice? I’m off to bake a cake (#39). And take pictures of it. Maybe if I get unstuck I’ll even post it. When I decided to make homemade pasta every month I didn’t realize Mr. Hippie would get involved, but tonight’s pasta was his idea! We made two batches because the pasta maker, like the meat grinder is a pain to clean. The first batch we made exactly like the last batch. The second batch however, I wanted to use for the Spice Rack Challenge so we modified it a little. Sheet of rosemary pasta waiting to be cut. When we got to the hand-kneading step (#8), we cut the dough in half. One half we treated just as the original recipe. To the other half we added a teaspoon of minced fresh rosemary, a clove of minced garlic and a turn of cracked pepper from the pepper mill. All the other steps were exactly the same. Waiting for their turn in the dehydrator. 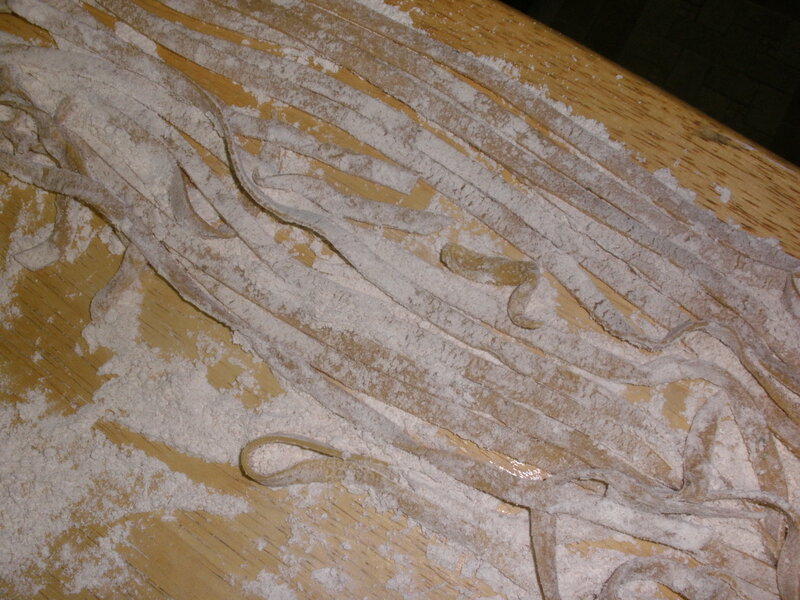 However, with twice as much pasta to dry, we needed to find a way to speed up the process. After a little internet research I decided that the dehydrator would help with this. We put pasta on the racks and dried it for about an hour instead of letting it sit out overnight like I did last time. It kept us busy adding and removing pasta from the machine all night, but we finished our pasta in a day instead of two and I didn’t have noodles hanging all over my kitchen. The pasta is fragrant and delicious. We could have easily doubled the amount of rosemary in the recipe, but rosemary can be overpowering and I didn’t want to ruin a whole batch of homemade pasta.